So, at some point in November 2017 I made a chat game (Like forum games except played in a chat, more specifically Discord). 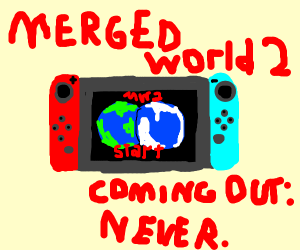 It was called "Merged Worlds" and was inspired by the games Earthbound and Mario & Luigi. I never really advertised it in Acid Forums because of a few reasons, I did advertise it somewhere else though, but not many people joined, and even less stayed. The people who played were people I knew. I feel pretty proud of it because it's the first long-term game I ran from start to finish without stopping it suddenly due to motivation problems or something, it lasted like 9 months. The gameplay had it's own bot which gave you a 2 letter combination with ZXCV, if you wrote it right you would deal damage, if not, you would deal less damage. If you hit enemies in a row you would get an extra turn. And to make it short the story was around Earth being linked to an alien world that evolved with magic and nature rather than technology while dealing with a dude with a book that allowed him to create anything he wanted. Idk what else to say, it just felt good. Current time: 2019-04-21, 10:52:44 Powered By MyBB 1.8.5, © 2002-2019 MyBB Group.